Ideally located in the heart of Hanoi 's old quarter, combined with warm, friendly, personalized service and modern amenities, Luxury hotel makes it the perfect choice for both business or leisure traveler,Luxury Hotel is also a backpacker accommodation, Considered a most reliable destination for any tourist or businessperson, the Luxury Hotel Hanoi is conveniently placed within walking distance to the shopping areas local restaurants, as well as banking. Luxury Hotel is also close to the central business district, major non-governmental offices and the famous Water Puppet Theatre. it takes just takes 35 minutes from the Noi Bai Airport,The ideally located in the heart of Hanoi's ancient streets, close by the famous Hoan Kiem Lake (Sword Restored). O Quan Chuong (The Gate of Hanoi Old quarter), oldest Dong Xuan supermarket , the Temple of Literature, Museum of Fine Arts and the Hanoi Opera House, a beautiful area to relax and visit night markets in the 36 ancient streets. Although our hotel is situated in the crowded old streets, our hotel rooms are very quiet at night. The deluxe French 19th century finished rooms are also noise resistant. we are a travel agency. Presently we are delighted to provide any tour information's in the all regions of Viet Nam, beside that we could offer many different packaged tours from the north to the south. Especially, the independent or group tours to Ha Long and Sa Pa are available everyday. * We also can arrange a visa to Lao or Cambodia and extend your Vietnamese visa. * We have the ability to book the air/ train tickets to Lao, Cambodia and other famous domestic locations, such as Hue, Hoi An, Nha Trang, Da Lat, Mui Ne, Sai Gon and of course you can travel there by open bus. * In order to satisfy your needs when staying in Viet Nam , we possess several different motorbikes, bicycles and cars for rent. After a pleasant day of touring, you may feel a little bit tired, so you will be served a cup of refreshing tea or coffee free of charge. Please come to discover our motto: LUXURRY HOTEL, YOUR FAMILY IN VIET NAM We guarantee that the above-mentioned slogan will reflect our real services. We are new hotel then we offer the following special promotion , 15% off on laundry services Free: Airport pick up with 3 nights stay (booking on internet with deluxe room ang suite room) Free: Pick up from the Bus or Train station Free: 30 minutes local phone call per day. Luxury Hotel boasts 36 luxurious and elegant rooms. All the rooms are decorated in a modern style and furnished with all the modern comfort. They provide a relaxing atmosphere ideal to unwind after a busy day. Rooms at luxury Hotel are facilitated with all amenities expected from a hotel of this category. Some of them have balcony offering incredible views over the wonderful city. 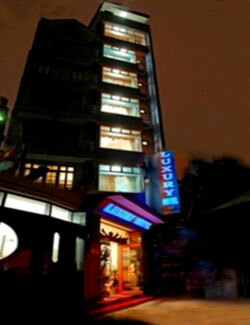 Luxury restaurant is located on the first floor and top floor. It offers a wide choice of contemporary dishes and a selection of traditional Vietnamese specialties. Everyday, an expert chef elaborates Western and Asian delicacies that can also be prepared for special occasions such as weddings and functions. Only the finest ingredients are selected to create those succulent dishes. The restaurant can be used for reception with over 100 people. Luxury Café is a lively bar located on the 1st floor. This is the place where guest can sip there favourite drinks while enjoying entertainment such as Jazz music. A wide selection of beverages is on offer in this warm atmosphere bar. The gift shop can be accessed from the main road or from the lobby. Here, guests will find the perfect gift from jewellery to Vietnamese handicraft.